Pongal 2019- The four-day harvest festival of Pongal is celebrated with much fan fare in Tamil Nadu, India. Check out date for Pongal 2019 and its celebrations. Pongal - Pongal is an important festival native to South India, particularly Tamil Nadu that marks the commencement of the harvest season or the sun's northward movement. Marking the onset of the new season, the Pongal festival is a great way of ushering in the new by wiping out old clutter and welcoming the year with new crops. The literal translation of the word 'Pongal' means "boiling over" or "spilling over" in Tamil, which in Indian tradition is a way of denoting abundance and prosperity. In this festival, milk is boiled over as a sign of plenty. 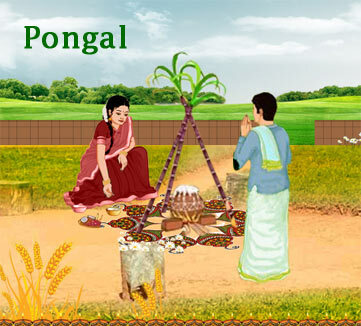 Pongal festival in India coincides with other designated state festivals such as 'Bhogali Bihu' in Assam, Lohri in Punjab, 'Bhogi' in Andhra Pradesh and 'Makar Sankranti' all over the country. The Pongal festivities in India are spread over four days of worship, starting from January 14 till January 17. The first day is called 'Bhogi' and the day is spent burning or discarding old and useless items of clothing as well as household items. New utensils are bought for use. The house is spruced up with traditional decoration and receives a new coat of varnish or paint. The second day of rituals and festivity is what constitutes the main Pongal celebration and marks the commencement of the Tamil month 'Thai'. It is also called 'Perum Pongal' or 'Surya Pongal' as people pay obeisance to the Sun God. The third day is called 'Mattu Pongal' and is dedicated to farm animals like bulls and cows that contribute to farming in the agrarian-based economy. These animals are given a proper bath and ritualistically worshipped. Women feed birds rice and offer prayers. The fourth day is the 'Kannum Pongal' when people step out of their homes to meet relatives and friends. The legend goes that once Lord Shiva sent his bull, Basava, to earth, instructing it to get an oil massage and bath every day and to eat once a month. Unwittingly, Basava was careless and ate daily and had an oil bath once a month. Shiva fumed with anger and condemned Basava to stay on earth, plough the fields and assist mankind in growing food. Hence, a lot of significance is attached to cattle in this festival. During Pongal, the house entrance is embellished with 'Kolam' or rangoli designs to welcome guests. Even shops and offices radiate the fervor of this festival, with beautifully drawn kolam made at the entrance. There is a custom of taking oil baths on this day and adorning new clothes. During the festival, families gather to feast and indulge in traditional dance such as kummi and kolattam and attend various cultural performances. The part most looked-forward to during the Pongal festival is the preparation of the Pongal dish called 'Venpongal'. It is made in both salt and sweet versions, one with ghee, cashew nuts, raisins, and spices and the other using jaggery. The fragrant aroma of spices and ghee emitting from every household's kitchen is mesmerizing and is a reminder of the festive occasion. When the milk boils over, people exclaim 'Pongalo Pongal' in excitement. Traditionally, the cooking pot has ginger, turmeric, sugarcane piece and banana tied at the neck. People exchange greetings and distribute Chakkara Pongal dish which is prepared with moong dal, rice, jaggery and garnished with dry fruits. People indulge in a game of 'jallikattu' involving bullfights and bird fights on this day. 'Jallikattu' in Madurai, Tanjore and Tiruchirappalli are major attractions during the Pongal festival. In this game, currency notes are tied to the horns of bulls while villagers are challenged to wrest the bundles from them. A legend associated with this sport is men emerging victorious could win the hand of a fair maiden. Afterwards, villagers enjoy community meals made from freshly gathered harvest. Given the fact that Pongal is about showing gratitude to the Sun God for a bountiful harvest, a ritualistic puja is performed where in ploughs and other agricultural tools are worshipped before collecting the paddy. On the main Pongal day, the Sun God is worshipped and offered the Pongal dish as 'prasad' amidst blowing of conch shells. It is made in such quantity that it can also be served in lunch as well. On the fourth day, 'Kanya Pongal', birds are worshipped and fed cooked rice. Finally, Pongal celebrated togetherness and acknowledges community effort in farming.